Are you visiting Tenerife soon? Whether you are coming to the island for the first time or you have been here in the past, we have a plan that could totally change the way you see the island: a paragliding tandem flight in Playa de las Americas. Maybe you were thinking about sunbathing and relaxing in the most beautiful places of the island. And we encourage you to do so, but why don’t you mix it with a gliding experience? If you landed on this website is because you are into original plans for your holidays. Isn’t that true? Imagine yourself flying across the sky like a bird. Picture your hand almost touching the clouds that surround you. And think how it is like to look down and see the top of the highest volcano on the Canary Islands. You can achieve this by booking your paragliding tandem flight in Playa de las Americas with Overfly Tenerife. If you want more information, just take a look at the different paragliding services we offer. You can also contact us and ask as many questions as you need. We’ll be happy to hear from you! 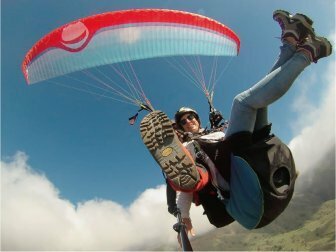 For both beginners and those who already have tried paragliding, Tenerife is one of the best places in the world to fly. Come and let us show you! Get started with our most popular experience, a tandem flight over the town of Adeje. Fly close to the clouds and enjoy the views of Ifonche’s Protected Natural Park. If you are the kind of people who gets bored on the roller coster this flight is for you. We are lucky to live in one of the most incredible locations in Spain (and the world! ): Tenerife. This island is so amazing that we never get tired of flying across its clear blue skies. Adeje, Fañabé, Orotava’s Valley, Teide’s National Park…We have countless places we would like to take you to. 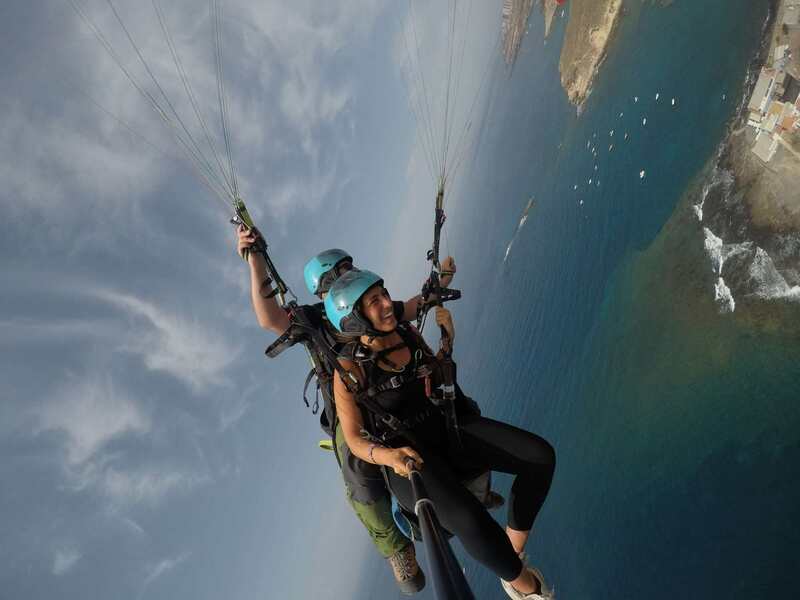 Why don’t you call us and try a paragliding tandem flight in Playa de las Americas? Our instructors are qualified to take the controls of our paragliders, which are designed to take advantage of the wind and going as far as you want to go. You should see the routes we have prepared! Moreover, we will give you a paragliding helmet and a harness before we start the experience. 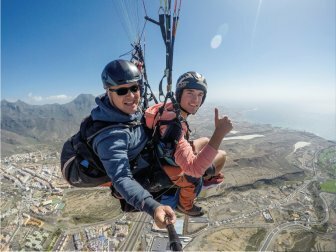 This way, you’ll get the most amazing views during your paragliding tandem flight in Playa de las Americas. What is paragliding? Just and see it for yourself! We could talk about the freedom feeling you get when you fly for ages. But we think you will never fully understand it until you try it for the first time. Beware; you might love it too much! Paragliding is a combination of adrenaline and beauty. You can’t imagine how Tenerife looks like from above, no matter how many pictures you see. Just come and see the beauty of the island before your eyes.